Today I‘m looking at two books concerning teachers and the sometimes (often?) superficial disconnect between teachers and students. But they are a lot more fun than that opening sentence. As a kid, seeing a teacher outside of school is always weird. I remember as a fifth-grader, at an outdoor mall with my mother seeing my teacher, Miss Duncan. She was a young teacher, pretty, with beautifully coiffed hair and always dressed immaculately. I was smitten with her. Seeing her outside of school, with her hair down, a much shorter skirt and sunglasses startled me and made me realize that teachers have lives other than at a desk in the front of a classroom. And it only intensified my ten-year-old crush on her. 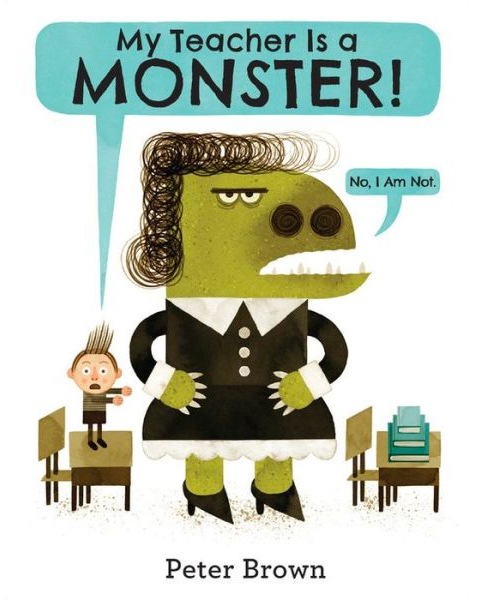 Peter Brown’s book, My Teacher is a Monster, is the story of a chance encounter of Bobby, a student, and his teacher, Ms Kirby, outside of the familiar environs of the classroom. Bobby insists his teacher is a monster because of what we as adults would consider normal disciplinary actions a teacher might take. When they run into each other at the park, things are awkward. This awkwardness is acerbated in a series of vignette illustrations of Bobby and Ms Kirby on a bench. You can feel the weight of small talk uncomfortableness in every line. It takes the wind carrying away Ms Kirby’s hat and Bobby heroically fetching it to crack the awkwardness. They each share a favorite activity they like to do in the park and over time Bobby sees Ms Kirby less and less as a monster. This is shown in the illustrations as we see her slowly change from a monster to a more conventional smiling human being. Would that persona be the same back at school? This is an endearing story that borders on sweet but has just enough edge to keep it from being so. The illustrations are a palette primarily of greens and browns and bit of blue, and are made with traditional media then digitally composed. They are, of course, masterful. It’s Peter Brown for cry in’ out loud. As an illustrator I am intrigued by these illustrations and inspired to try some new techniques. 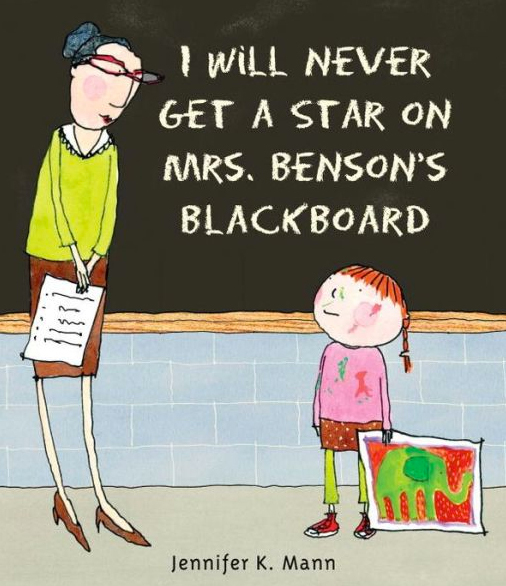 In contrast, Jennifer K. Mann’s I Will Never Get a Star On Mrs. Benson’s Blackboard takes place entirely in the classroom. It is the semi-autobiographical story of Rose, a doodler and a daydreamer who wants desperately to get a coveted star on the blackboard. She tries earnestly to do things—math, reading aloud— that might garner her a star, but fails. 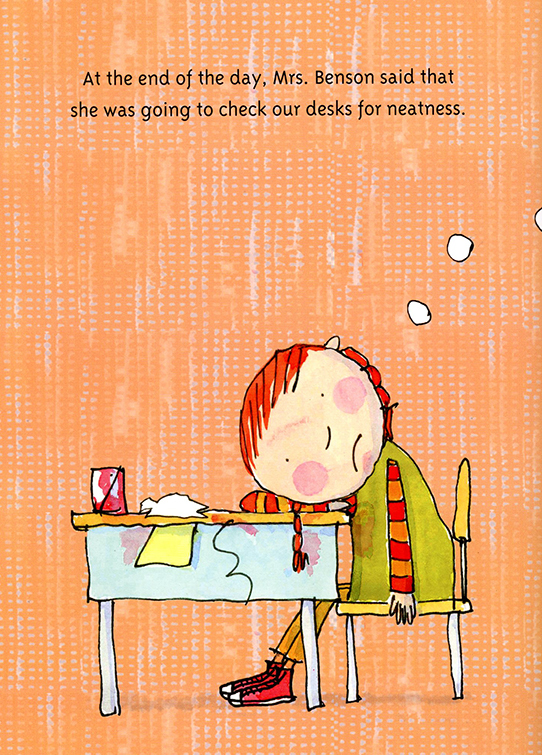 To make things worse, Mrs Benson is going to do desk inspections at the end of the day and Rose gets a tummy ache worrying that her teacher will dump the contents of her messy, messy desk on the floor. She would never get a star on Mrs. Bensons’s Blackboard. Fortunately she is saved by the bell and her desk would not be checked until the next morning. Arriving at school early, Rose cleans her desk furtively. But can the desk of an artist remain clean? Will Rose ever get a star on Mrs. Benson’s blackboard? I have many memories of anxiety and worry as a student. I remember nights of restless sleep fearing the consequences for my previous actions or inactions the next day at school. I Will Never Get a Star On Mrs. Benson’s Blackboard is a nice reminder that fear of teachers is most often not warranted. And belief in yourself is. Mann’s illustrations are wonderfully loose and painterly and fit the characters perfectly. Both of these books are fun and moving. Your homework is to find copies and read them. 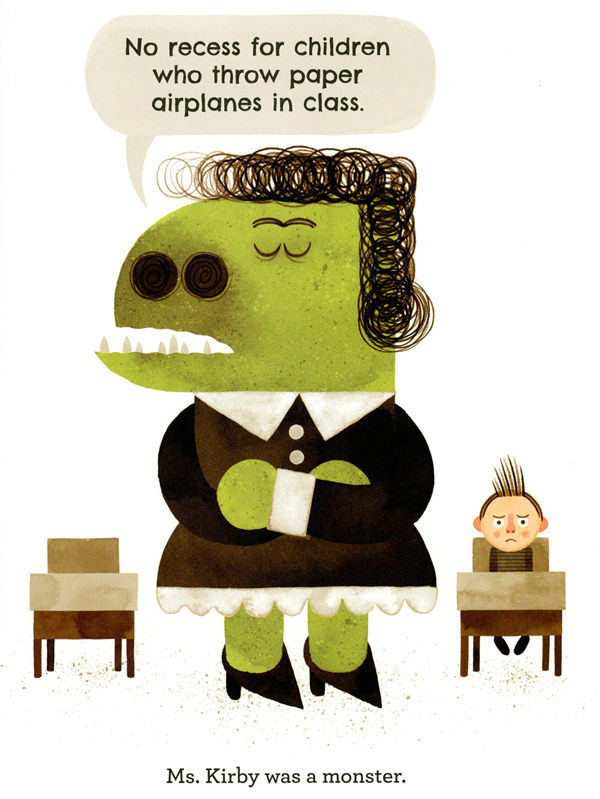 I'll Never Get a Star, Jennifer K. Mann, My Teacher is a Monster, Peter Brown, teachers. Bookmark. Great post! I love these two books. They are so well done. Thanks for sharing. Well, that’s a homework assignment I’m happy to complete. Thanks, Kevan–these look great! I love Ms. Kirby, and I’m sure I can identify with Rose – thanks, Kevan! I loved having a homework assignment! Only I’ve already read these. Can I get extra credit if I share my favorite teacher book, The Junkyard Wonders by Patricia Polacco? Loved your insights, especially coming from an artist. LOVE Pete Brown and this book in particular. Cracked me up. Will definitely need to pick up the Jennifer Mann one – heading to my library’s website to put a hold on it now! Thanks! These are going right onto my TBR list. I hadn’t seen either of these. Thanks for the post. I have read one. Cannot wait to read the other. I’m heading back to the classroom this fall to teach 1st gr. I look forward to reading these! 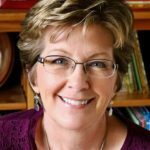 I grew up in a small town and went to church with my principal. Our family and his often went camping together, too. So you’d think I would’ve known not to gawk in wonder when, while shopping with my mother, I ran into my 3rd grade teacher with her kids. But I still remember that “Wha–? Wait a minute, she has kids? !” feeling. I’ve already read and loved My Teacher Is a Monster. Will look for Ms. Mann’s book next. Sounds fun. If only all homework was so much fun! Yes, sir. Off to do my homework! Oh, hooray!! Somehow, Kevan, I have only just stumbled on this–and so glad I did! (Not sure how it zipped past without my seeing.) Thank you for the lovely lovely review. Now I am off to clean my desk!